‘The body of man has in itself blood, phlegm, yellow bile and black bile. These constitute the nature of his body, and through these he feels pain or enjoys health. Now he is particular healthy when these constituents are in due proportion to one another with regard to blending, power and quantity, and when they are perfectly mixed. Pain is experienced whenever one of these constituents is deficient or in excess or is isolated in the body and is not blended with all the others. For, whenever any one of these is isolated and stands by itself, of necessity not only does the place which it left become diseased, but also the place where it stands and floods causes pain and distress through being over-full.’ (Hippocrates – De natura hominis, Ch. 4). An analogue of the Empedoclean theory of the four elements is evident. The division of the human character into four types, based on the humours (‘humores‘) was a direct and practical application of his theory, although the Hippocratic treatise ‘De Vetere Medicina’ vigorously emphasized the distinction between philosophy and medicine, and rejected the intrusion of philosophical postulates into medicine. ‘The classical medical theory of the four humours arises immediately out of the pre-Socratic philosophical background and is a direct corollary of the Empedoclean four element theory in that these four humours play a role in the human body analogous to that played by the elements in the world at large’ (LONGRISS, 1993; p. 92). ‘The origin of diseases is, I suppose, plain to all. 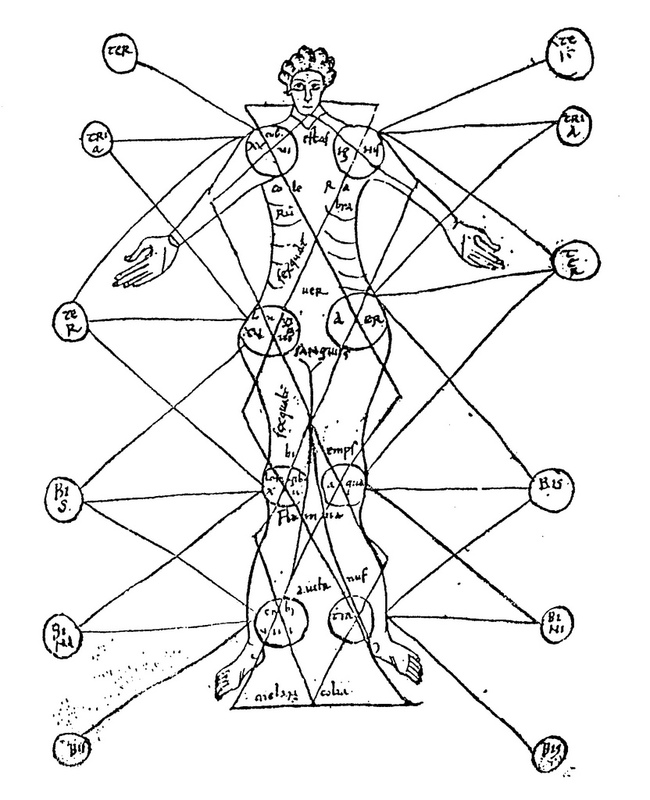 There are four forms from which the body is composed, earth, fire, water, air and disorders and diseases arise from the unnatural excess or deficiency of these, or from their displacement from their proper place to an alien one; and, furthermore, since there happen to be more than one variety of fire and the other elements, the reception by the body of an inappropriate variety of one of them and all similar irregularities produces disorders and diseases’. This classical organization of knowledge was updated by the Greek physician Galen (129 – 199 AD). Antiochus of Athens, living in the second century AD, gives a scheme, in which the temperaments are part of a general orientation in the universe. Fig. 336 provides a compilation of the visible expressions of classical tetradic thinking (from an astrological point of view). An actual philosophy, if it ever existed in a corpus of knowledge, does not show in the tabulation (BOLL & BEZOLD, 1931; p. 54; SEZNEC, 1953/1972, p. 47). Fig. 336 – The tetradic scheme, as advanced by the astrologer Antiochus of Athens in the second century AD, showed that all physical beings were thought of as related to the zodiac. 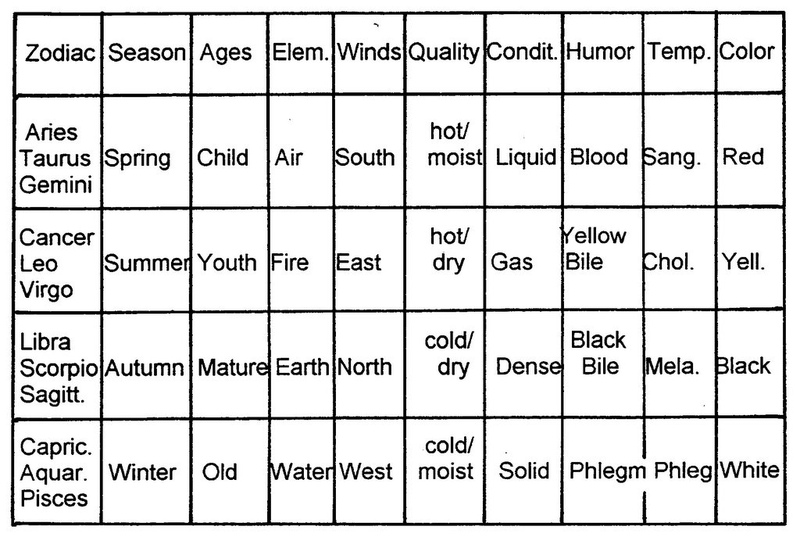 The temperaments became a common element in the later medieval understanding of a tetradic setting (fig. 337 – 338). Fig. 337 – The humors and the elementary qualities have a distinct location within the human body, and possible relations are established. Burgos de Osma, Spain; eleventh century. In: DOOB (1997). The temperaments are apparently suited or unsuited for a particular period in a human life: so is the sanguine character (hot-tempered) difficult to manage in the first twenty years of life, but improves with age and particular useful in the ‘senectus‘ period (40 – 60 years). The choleric character faces uncertainties between the age of twenty and forty. The melancholic and phlegmatic characters encounter growing difficulties in the ‘senectus‘. The introduction of the printing press, just before 1500 AD, started the wider distribution of information (fig. 339/340), including the ‘classical’ tetradic knowledge. The interpretation, however, did not escape the dualistic bonds of its time. The temperaments were often understood in a numerological context, and no longer connected with the Hippocratic/Epicurean framework of a neutral tetradic division. The concept of the disturbing of the equilibrium within the humours (isonomia) was much easier to grasp within a dualistic mind and the medical practice of bloodletting, for instance, by incisions or leaches, continued long after its heydays in the seventeenth century. Fig. 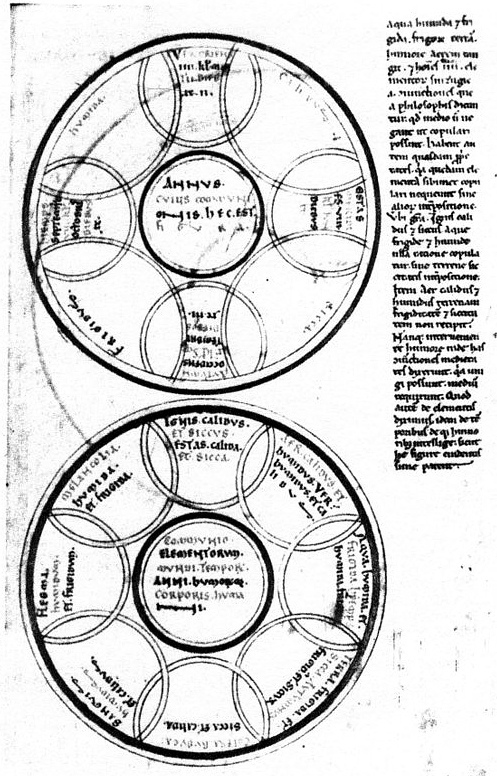 339 – The four temperaments on a German calendarium, around 1480, as given in Guido Majno’s book ‘The Healing Hand: Man and Wound in the Ancient World’ (1991). The subtitles interrelate the temperaments with elements and character: (1) phlegmatic with water and subtility, (2) sanguinistic with air and pride, (3) melancholic with earth and depressiveness and (4) choleric with fire and adventure. In: HOES (1994). Fig. 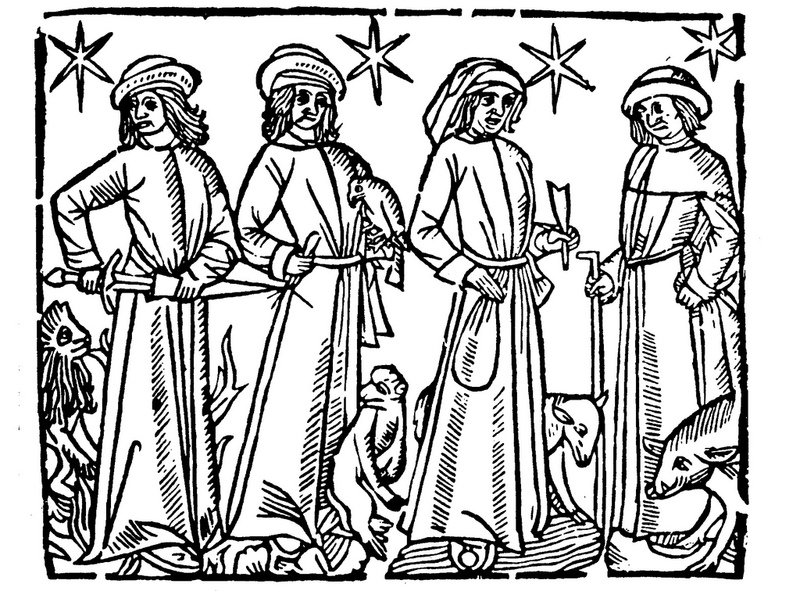 340 – The four temperaments on a woodcut from an anonymous artist, 1519. 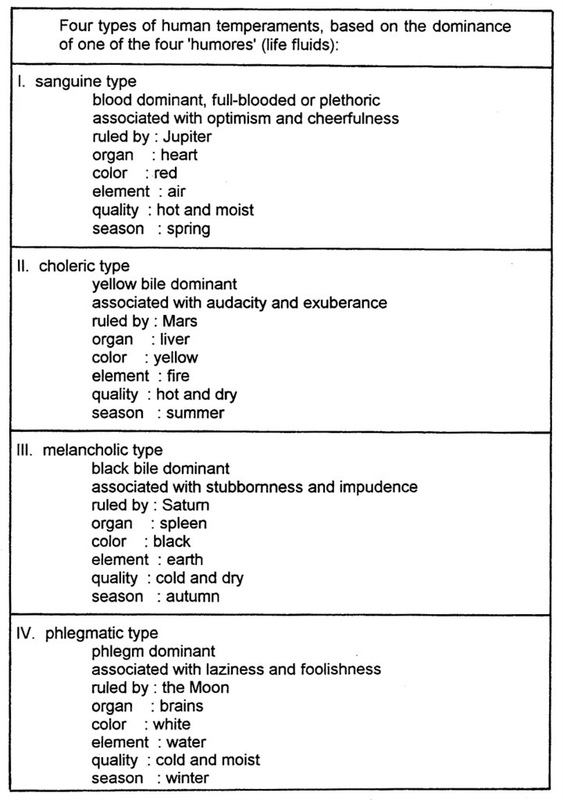 Top-left: phlegmatic; top-right: sanguinistic; below-left: choleric and below right: melancholic. In: BASTIAN, et al (1960). The temperaments were used in an illustration of Erhard Schön, accompanying a poem of Hans Sach (fig. 341). The poem was a parody on the worldly behavior of the pope Clement VII, or Giulio di Giuliano de’ Medici (KUNZLE, 1973). The occupation of the Holy Chair (from 1523 – 1534) of this Renaissance aristocrat and grandson of Lorenzo the Magnificent (1523 – 1534) was hallmarked by the Sack of Rome by the troops of Charles V in 1527. Fig. 341 – The four characteristics of wine expressed in the four temperaments of man. Top left: the sanguine temperament is drinking in style. It is a picture of peace, with a lamb to accentuate the rural nature. 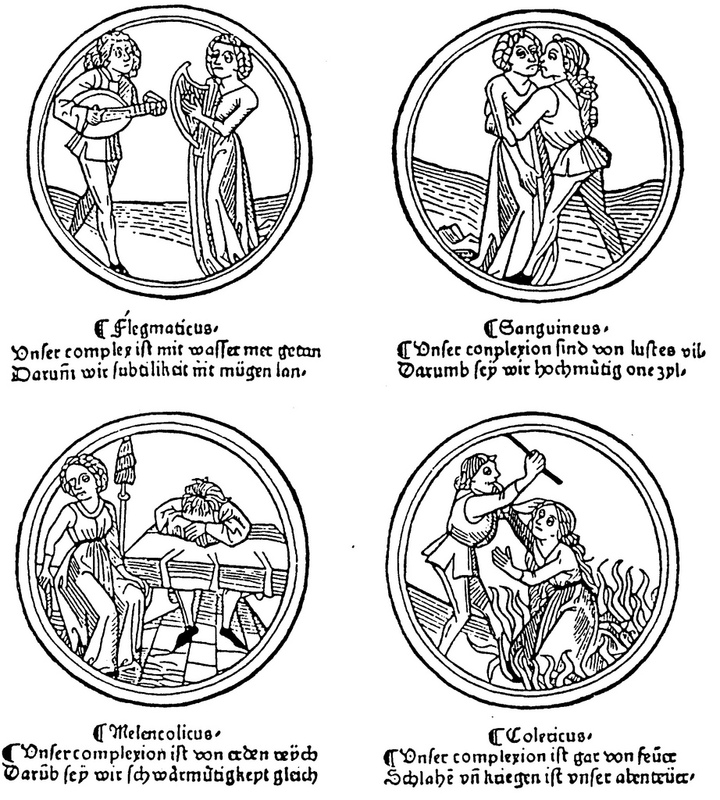 Top right: the choleric character is tempted to quarrel and swords are drawn. A dog meddled in with the fight. Bottom left: The phlegmatic temperament is a noisy drinker, lacking in style. He is ill-mannered and foolish, associated with a pig. 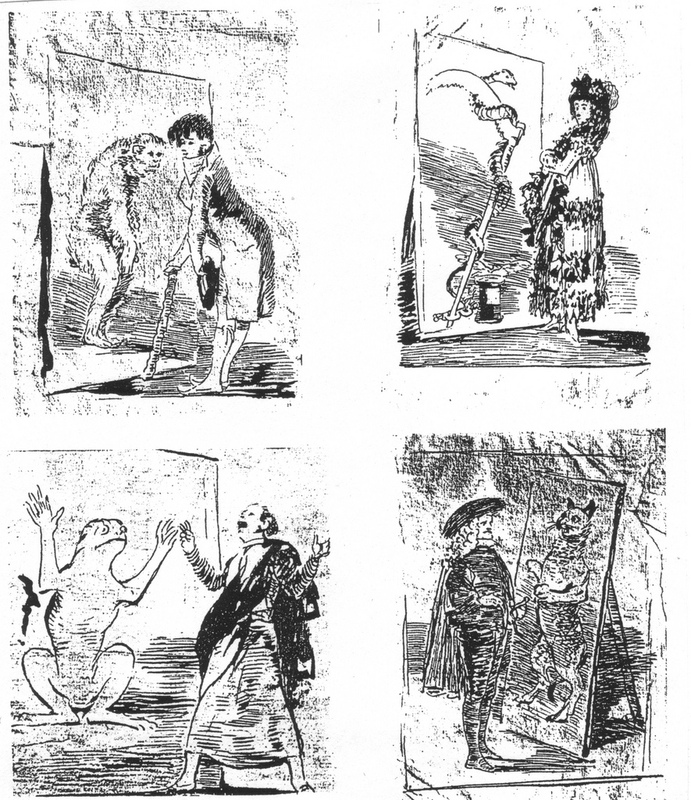 Bottom right: The melancholic drinker is not much better and makes a fool of himself by doing odd things. He is characterized by a monkey. The picture by Erhard Schön, dated around 1530, was also a parody on the worldly exuberance of the pope. In: KUNZLE (1973). The influence of wine was demonstrated with the four temperaments and psychological types: 1. 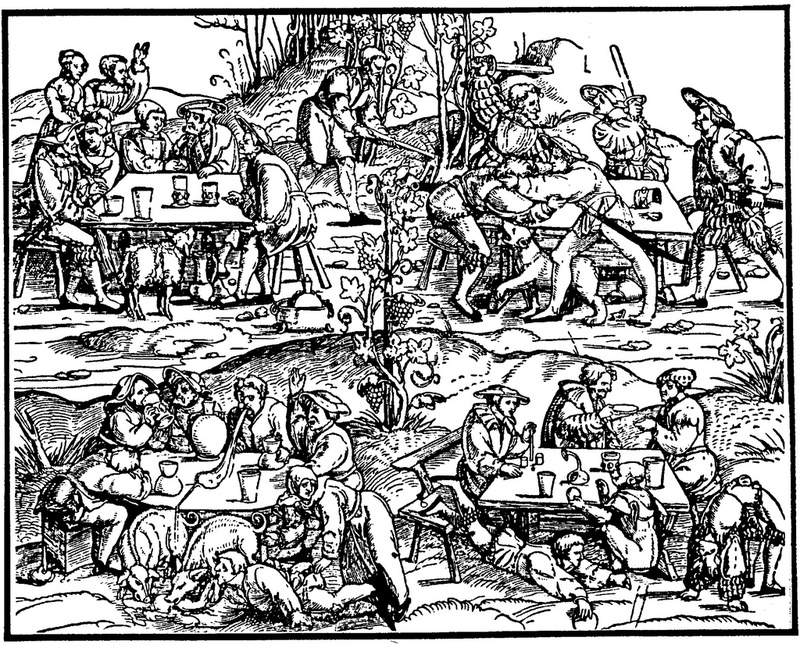 The sanguine character is often a drinker, who remained a lamb, if he has too much (top left); 2. 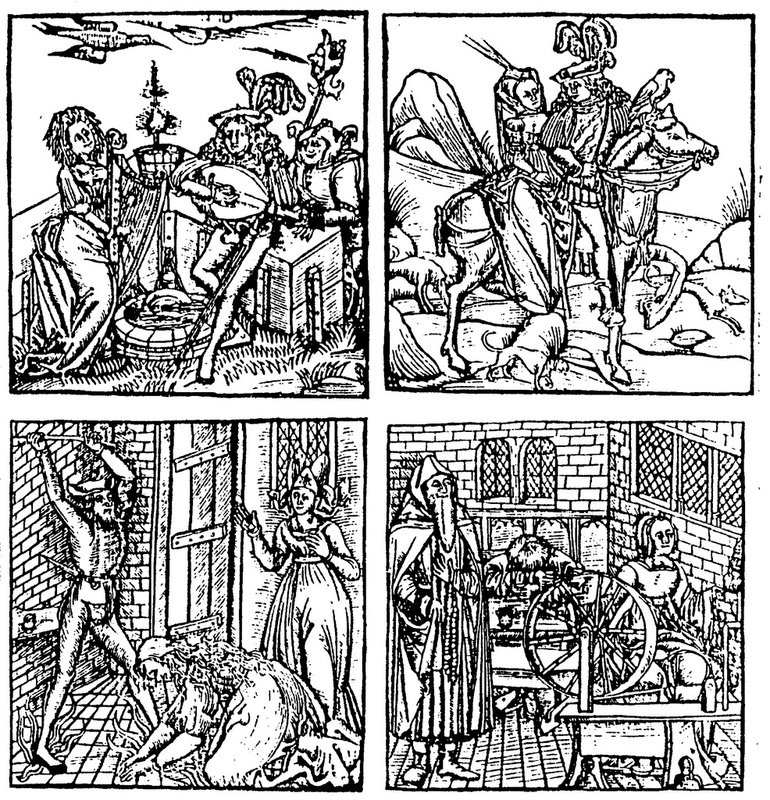 The choleric drinker becomes nasty and violent and behaves like a dog (top right); 3. The phlegmatic drinker looses decorum and acts like a pig (bottom left); and finally 4. The melancholic drinker makes a fool of himself and is portrayed as an ape (bottom right). Another association of the four human types with animals was given in a sixteenth century edition of ‘The Shepheardes Calendar’ (fig. 342). This was a poetic work by Edmund Spenser (c. 1552 – 1599), written in a deliberate archaic style to suggest a connection with medieval literature. He became known for his epic poem ‘The Faerie Queene’. Fig. 342 – The personifications of the four human types related to animals. From an English edition of ‘The Shepheardes Calendar’, a work by Edmund Spenser, first published in 1579. In: TAPLIN (1990). The choleric personality to the left is tempted to use force: he draws his sword (with a reference to Mars, the ruler of this temperament). His hot-tempered and aggressive complexion is connected with fire and a lion. Schön made use of a number of quarrelsome men with swords, but associated the temperament with a dog. The sanguine character is a gentleman, a falconer, but also a fool. He is riding high with a lady on a horse (in fig. 340), but behaves like a monkey. Erhard Schön associated him with a lamb. The phlegmatic personality is characterized by subtlety and friendliness and, normally, associated with a lamb. However, he can also lose decorum, is foolish and act like a pig (in Schön’s parody). Finally, the melancholic character is associated with a pig on ‘The Shepheardes Calendar’. Erhard Schön used – forty years earlier – this animal for the phlegmatic character. Of a later date (1797 – 1798) was a drawing of the four temperaments by Francisco Goya, now in the Museo del Prado (LOPEZ-REY, 1953; fig. 68/70/72/75) (fig. 343). NORDSTRÖM (1961; 1962) suggested an inspiration of Goya by the impressive works of Lebrun & Bailly (1668) and Leclerc & Lepautre (1670). They published an exposé of the royal tapestries with motifs like the elements and seasons. Goya consulted the epic work of Bernard de MONTFAUCON (1719) – ‘L’Antiquité expliquée et representée en figures’ – during his illness in 1792. Goya (1746 – 1828) treated the temperaments with an unusual symbolism. A dandy – with a reference to style and vanity – faced a mirror as a sanguine character. A woman was represented as a snake, with the attributes of a chain (of Time, Cronos/Saturn). She holds a winged hourglass, pointing to a melancholic personality. A man, reflected as a frog, was identified as a phlegmatic character. The choleric type mimicked as a catlike animal. The dresses were indicative of a social division: a dandy is sanguine, a woman melancholic, a student phlegmatic and a constable choleric. Fig. 343 – The temperaments of Francisco Goya (1746 – 1828). Four pen drawings by Goya (1797/1798). Prado, Madrid. In: NORDSTROM (1961; 1962) and WYNDHAM LEWIS (1968). The description of human characters according to their temperaments is still in use to the present day. It proves the extraordinary versatile manner in which the classical-medical (four)division can be used, even if the philosophical background of such an apportionment has been long forgotten. BASTIAN, Harmut; GEIGER, H.; HERMANN, P. (Ed.)(1960). Handbuch der Wissenschaft und Bildung. Band II. Econ Verlag, Dusseldorf. BOLL, Franz & BEZOLD, Carl (1931). Sternglaube und Sterndeutung. Die Geschichte und das Wesen der Astrologie. B.G. Teubner, Leipzig/Berlin. LOPEZ-REY, Jose (1953). Goya’s Caprichos. Reason & Caricature. Princeton University Press, Princeton. NORDSTROM, Folke (1961). Goya’s Portraits of the Four Temperaments. pp. 394 – 401 in: MEISS, Millard (Ed.)(1961). De Artibus Opuscula XL. Essays in Honor of Erwin Panofsky. Vol. I. New York University Press, New York. – (1962). Goya, Saturn and Melancholy. Studies in the Art of Goya. Almqvist & Wiksell, Stockholm. THORNDIKE, Lynn (1958). De Complexionibus. Pp. 398 – 408 in: ISIS, Vol. 49, part 2, no. 156. June 1958. WYNDHAM LEWIS, D.B. (1968). De wereld van Goya. Becht, Amsterdam/Diogenes, Antwerpen. Dit bericht werd geplaatst in Geen categorie en getagged met Antiochus of Athens, Aristotle, element theory, equilibrium theory, four humours, Francisco Goya, Galen, humours, isonomia, Paracelsus, temperaments, The Shepheardes Calendar. Maak dit favoriet permalink.